I first discovered Cheryl of Meadow Mist Designs in time to join her second mystery quilt, Midnight Mystery, which started in June of 2015. 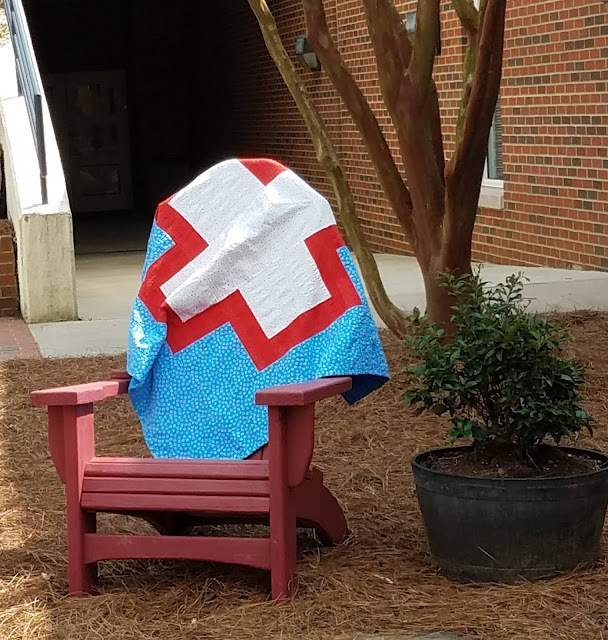 I became acquainted with Paige Alexander of Quilted Blooms during the 2016 New Quilt Bloggers Blog Hop when we were both participants, and I was in the group mentored by Cheryl. In addition to being amazingly talented quilters, both ladies are incredibly nice. 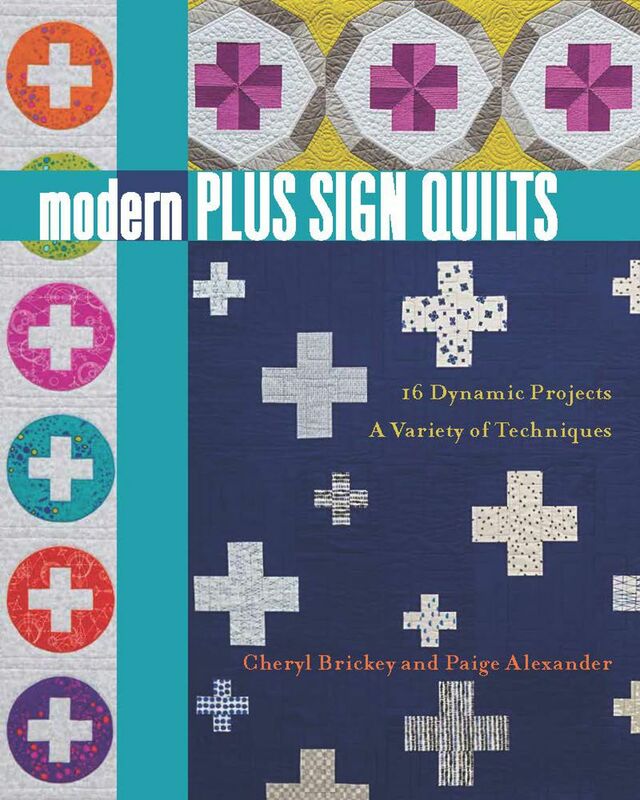 The two of them recently released a book they wrote together, Modern Plus Sign Quilts. I was thrilled and honored to be among those asked to participate in their book hop. I was lucky enough to get to see pictures of all 16 designs to choose the one I wanted to make. There were three designs that I was really drawn to and all of them are patterns I know I will make at some point, and I even have fabrics in my stash picked out. 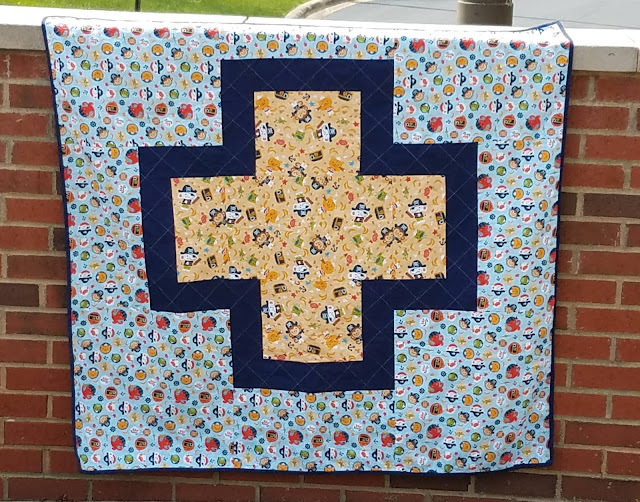 In the end, I chose one of the simplest designs in the book, Message in a Bottle, because I knew it would sew up quickly and make a fabulous donation quilt for Project Linus. And I liked it so much that I made two! My first version started with a blue floral print that was in a bag of fabric my friend Snow de-stashed and gave to me. 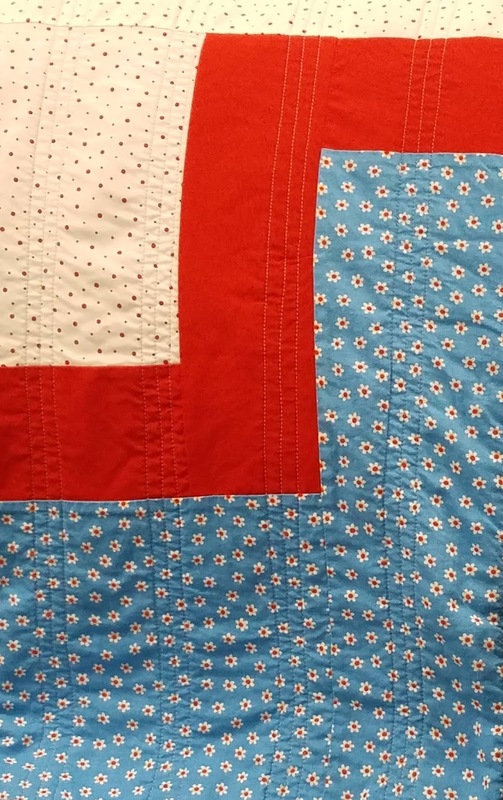 I knew I wanted a red & white polka dot to compliment the look of the small flowers and I when I saw the print from Red Dot, Green Dash, it fit exactly what I pictured. I added Kona Tomato to tie it all together. I quilted in straight lines in groups of three. I used 2" wide painters tape to mark the gaps. This will be going to the Charlotte chapter of Project Linus. One of the organizations that my chapter supports is a camp for children of wounded or fallen military parents. 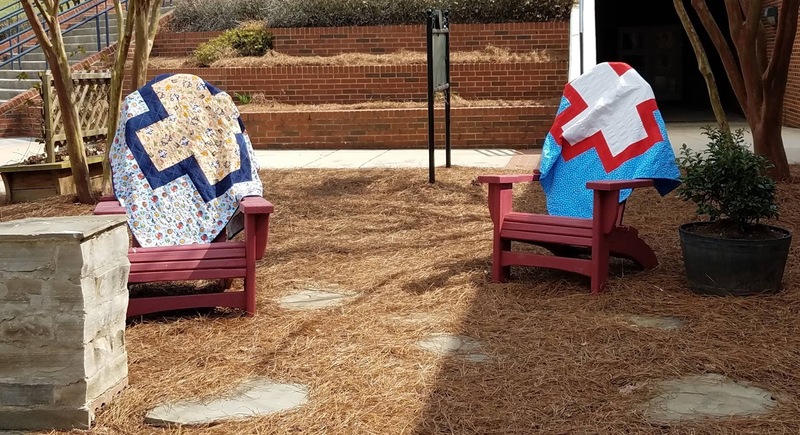 They specifically want quilts in red, white, and blue. My second version uses novelty fabrics. (Surprise, surprise!) The two prints are from the Ahoy Primatey line that I believe was created for JoAnn Fabrics. I got a charm square in an I Spy swap several years ago and loved the name, so I went looking for it. (I love puns, Husband loves monkeys, it was an obvious fit.) I bought 3 1-yard cuts from etsy. There was more of the blue print in that de-stash bag from Snow, giving me enough for the background. The solid is Kona Storm. Small or medium scale novelty prints work well for this pattern, especially if they are not too directional. I used a cross-hatch for the quilting. My original plan was to donate this to Project Linus as well, but Munchkin has become quite fond of the pirate monkeys, so this may end up as one of his. He's been very into blankets recently and plays nap time with his stuffed animals, and of course they need to be tucked in! This pattern comes together really quickly. I made these two simultaneously. It took me about an hour and fifteen minutes to do all the cutting for both and I pieced the two of them in two and a half hours. That's two quilts cut and pieced in under four hours! 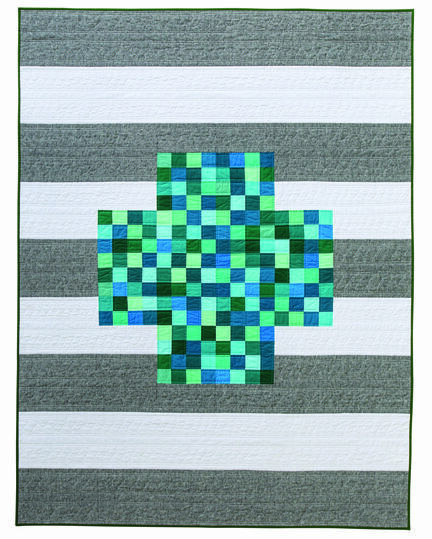 This would be a really great pattern to use to teach someone to quilt. There are not a lot of pieces and the top comes together quickly so there is a bit of instant gratification. It's also not overwhelming to pick out three fabrics that coordinate. And at 48" square, it's a decent beginner size. Modern Plus Signs features sixteen patterns. Designs are ranked on three levels of difficulty and there is a really good mix; there is truly something here for every quilter from absolute beginner to advanced quilters looking for a challenge. Both Cheryl and Paige are selling signed copies in their etsy shops. It's a book you'll be glad you have! And I have an idea of something I want to try with Celestial. 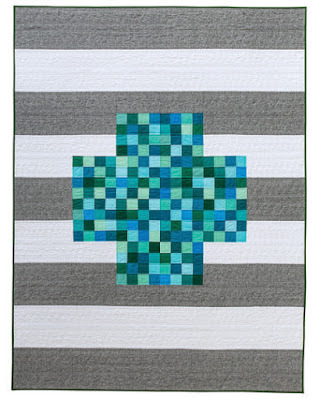 This is one of the featured designs tomorrow on the blog hop and I'm really excited to see what other quilters did with it. Looking for the full schedule? 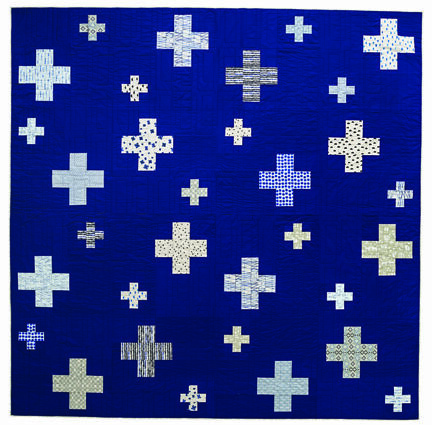 You will find versions of all of the quilts from Modern Plus Signs spread out over two weeks. Emily @ The Darling Dogwood ← You Are Here! Cheryl and Paige are also planning a quilt along later this year featuring designs from the book. I'm looking forward to it! These are really cute quilts, Emily! I love the fabrics you've chosen - very kid friendly! Every time I see a hop post I add another quilt from this book to my list of future makes. This one goes on! Both version are lovely, Emily! Wow, they came together rather quickly for you, that's great to hear. 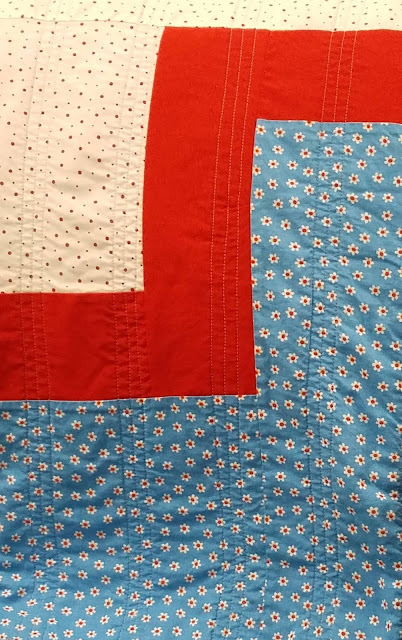 I really like how you quilted the red, white and blue one with triple quilting lines, very clever. I know some kiddos will be thrilled with these and glad one of those is yours. Thank you for joining the book hop! Two wonderful quilts! So cute that your little one had his favorite and took claim to it. Great job! Thanks for sharing! 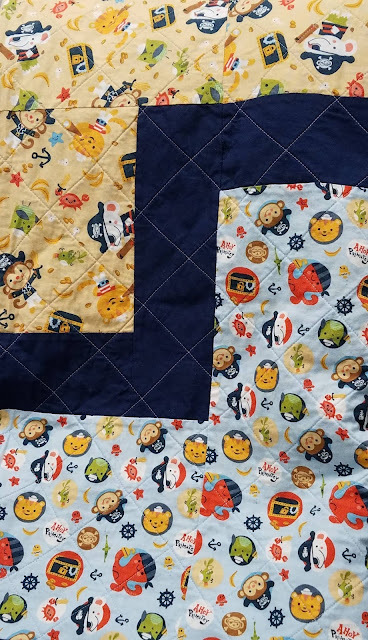 The navy is great in your second quilt,and the fabrics in your #1 are lovely,These will be winners for two lucky little people, and we think we know where one will be going.. These are such fun, love the pirate monkeys with the blue outline! So cute! Love that last photo. These turned out adorable! I love the pirate monkey one. This quilt was a perfect choice to let those fun prints, just have fun. Such cute kid quilts! Love your pirate son's game of nap time with his stuffed animals!!! I love both of these! From the pictures you had sent, it looked like the red, blue, and white version was made from solids, but I can see from these pictures that they are actually small scale prints. I really love both colorways, thanks so much for being part of the hop! They turned out great! Project Linus will be delighted! Both of these quilts are beautiful. 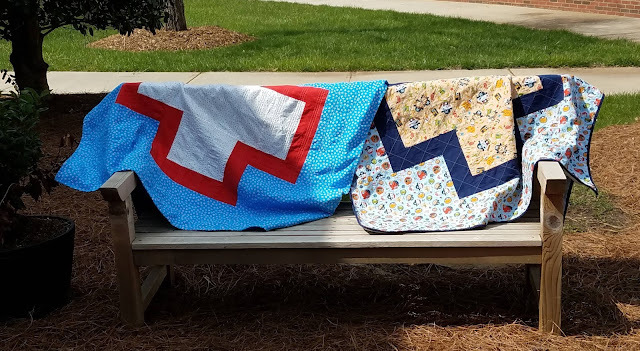 I love the simplicity of this pattern and I think it's great that you chose to make donation quilts for your spot on the blog hop. Both of your versions turned out beautifully! Once the UFO list gets worked down a bit, I'm definitely going to make a pattern or two from this book. I agree lots of cute ones in the book, yours turned out wonderful. The book has so many amazing quilts! Your versions are fun and wonderful! Thanks for sharing!! How fun to make the same designs in two different sets of fabrics! You've done a lovely job with this quilt design! I agree, it does look like a wonderful pattern to teach a new quilter some cutting and piecing for an afternoon project. 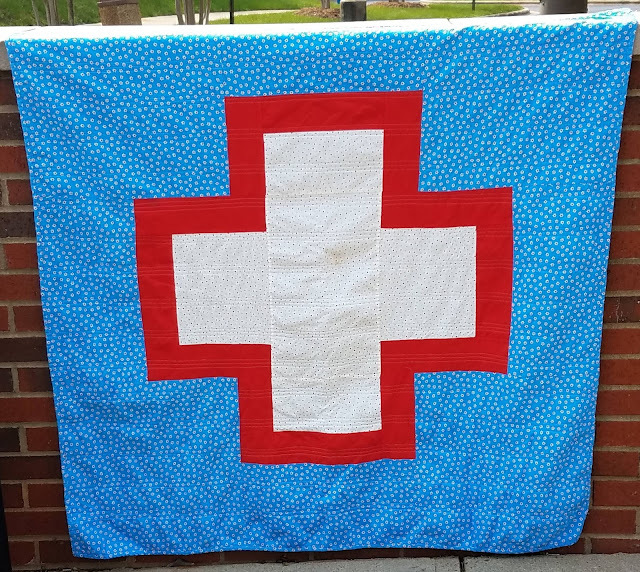 Great idea for a donation quilt! I'll have to copy you methinks! Both of your quilts are beautiful! It's the best compliment when our littles cherish our quilts so much. You can't say, no! Fantastic donation quilts! Great job. This is a great pattern! It is a good one for showing off fabrics - even some larger scale florals or novelty prints would be nice for the background. Both of yours are wonderful. I can see why your little guy wants the pirate quilt - fun for fort building and pretend play. I really like the fabric choices! These are such fun quilts! Nice color choices on these - both look great! These are both wonderful quilts for donations, if the BOTH make it that is. Love the fabrics you chose Emily, and you are right, it is a great pattern for a beginner. These are both wonderful quilts. I especially like that you included the time spent in making the tops. The visuals for each are different and very sweet. How wonderful to make quilts for Project Linus! Love your fabric choices. This is a great pattern for making a fast quilt, isn't it? And I love the dramatic nature of it--with the large plus sign! Love your versions Emily! Fun fabrics. They will be loved quilts by who ever gets them. Nice work! One to give and one to keep. Perfect! I really like that you showed us this pattern in nearly solids and busy prints - it looks fantastic either way. Nice job! really cute quilts, and I can't believe how fast they were for you! I appreciate so much of the info here, including how much time it took you to cut and piece the two projects. I usually mark my quilting lines with a Chacco liner, but I'm intrigued by your painter-tape method. Any words of wisdom on that front before I give it a go myself? These are so sweet and so special too! Both kids will love them!